MANILA, Philippines - Lea Salonga's young artist Reynan Del-anay sings Asin's 'Itanong Mo sa Mga Bata' during the live semi-finals of the country's popular vocal competition 'The Voice Kids' Philippines on Saturday, August 22, 2015 at the Newport Performing Arts, Theater, Resorts World Manila in Pasay City. 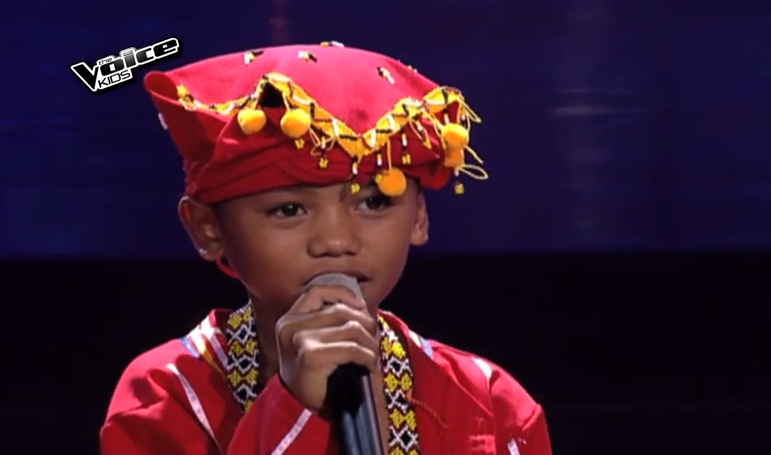 Reynan Del-anay, 11 years old from San Fernando, Bukidnon is among the Final 2 artists of Team Lea. The Manobo kid became emotional on his performance. "Ikaw pag kumakanta ka, nagkukwento ka na talaga," Coach Bamboo told Reynan. Aside from the Manobo boy, fighting for a slot in the finale are his teammate Esang De Torres, Kyle Echarri and Zephanie Dimaranan of Team Sarah, Sassa Dagdag and Elha Nympha of Team Bamboo. Text VOICE REYNAN and send to 2366 for all mobile subscribers. 1 vote per artist per sim is allowed. Tariff is P0.50 per vote for Globe, TM, Smart, Talk 'N Text, ABS-CBN mobile subscribers and P1.0 for Globe postpaid subscriber.